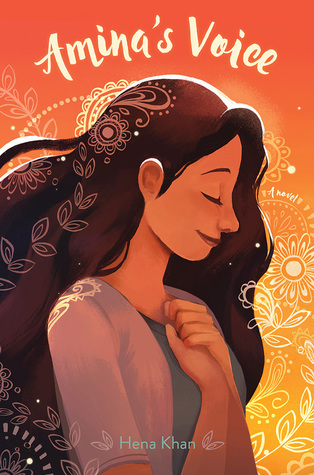 I have been looking forward to Amina's Voice by Hena Khan since first hearing about it. It is the first novel from Salaam Reads, a new imprint of Simon & Schuster and I was eager to see what it would be like. It is excellent in every way possible and a much needed book for multiple reasons. Amina is is a Pakistani American girl living in Wisconsin trying to survive middle school. She loves singing, but is afraid of the spotlight. Her best friend is acting different and seems interested in befriending one of the "cool girls" who used to actively make fun of them. Things at home can be stressful too as her brother, now in high school, is starting to have more conflicts with their parents. Then her family gets a visit from their father's older brother from Pakistan who is more conservative and strict in his religious views. Amina is more confused than ever. When their local mosque is vandalized, Amina needs to find her voice and her courage as she watches the people she loves most grieve and come together. Amina is a wonderful main character and a her narration allows the reader to know her fully. She is a shy, introverted girl and very much a people pleaser. This causes her to internalize a lot of her struggles and jumble her thoughts. She is incredibly relatable even if this is not your personality type. She is a talented singer and wants to sing a solo for her school, but is too afraid. She is a little disgusted with herself because of that fear, but doesn't know how to overcome it. This is a story of Amina's journey to more self confidence and finding her voice when she needs it. This is also a really good book about friendship. Amina's best friend, a Korean American girl, is becoming a citizen and thinking of changing her name to something more "American". At the same time she wants to spend more time with Emily, who used to be super popular and taunted the girls about their "strange" food and customs on multiple occasions. Amina is not quite ready to be so forgiving and there is some conflict between the three. I really enjoyed Khan's approach to this situation. Friendship troubles in a three friend group with one best friend pair having different notions of how to go on in middle school is a common theme in MG. I really like the way it worked out here. All three of the girls learn more about themselves and each other and their friendship grows and changes as a result. There is drama caused by typical middle school thinking and actions, but I feel the resolution is also genuine and shows how friendships are able to evolve and worth working for. Amina's family life is an important part of her story as well. Her parents are immigrants and have very firm ideas about how they want their children to go through life in America. Amina's older brother is pushing the limits set on him and it is creating tension in the family. Again, I really like the way this was handled. Amina's parents are fabulous and it is clear in every scene they are in that they love both their children very much. They have talks with them. They have firm rules, but they also try to explain things. The family's Muslim faith plays a central part in everything they do and this was wonderful to see. Religion plays a huge part in the lives of so many MG readers and yet we don't really see it play as much of a part in the books they read. In this case, it showcases a religion (the author's own) that many people don't know a lot about and misunderstand so its inclusion here is perfect for both those reasons. In addition to the religious themes, the family's interactions also bring out aspects of what it is like to be an immigrant family and the conflicts that can arise from that. In many contemporary MG fiction books, the main character deals with issues at school and at home, with friends and with family. Amina's Voice stands out in how well Khan weaves all these threads together. They are intricate parts of who Amina is. This is her story and all of these flow out of that. The mosque being vandalized is an important part of the book and a catalyst for Amina in many ways, but it is not the main point. It is wonderful to see the community rally together in the wake of it though and to be there with Amina as she processes her fear and grief. I read an ARC given to me by the publisher, Salaam Reads, at ALA Midwinter. Amina's Voice goes on sale March 14th.